One of the most respected names in guitar amplification. But how does this reissue stand up to the hype? and what about the cost? and importantly what about the volume levels? 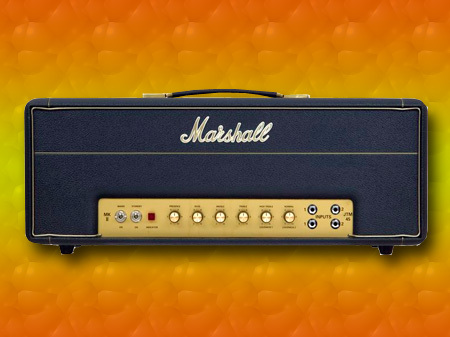 The Marshall JTM45 is reputed to be one of the finest amp heads in the world. The originals cost really big money these dates too. But you might have known that Marshall Amps here in sunny old England would one day take current technology and make a reissue. In fact if my memory serves me correctly these were reissued back in 1991 and have been made ever since as a reissue. The reissue is NOT a JTM45 - remember that. No matter how you look at it, this reissue will never be a 1966(ish) JTM45 that Jim made in those days. Then they were individually made, one at a time and the volume was low. Technology of the time was not great, and all the components had to be soldered on to a 'turret board' to then fit in to the chassis. In fact it was all hand wired. But don't assume that Jim Marshall made everything, indeed far from it. He was like most guys of the day, buying bits and pieces from here and from there - hence you see changes on the original JTM45's such as differing transformer manufacturers and different brand capacitors etc. You see, in those days, a capacitor was a capacitor, and a resistor was a resistor. Whereas today, some guys will 'swear' by a particular brand of capacitor (say) and tell you they hear the difference between that capacitor and some other brand. Well the truth is, they may well hear the difference, but you know what - that 'difference' in sound is not worth jack if your audience can't tell.. and mark my words - most of the audience don't have tuned ears like a bat to tell the difference. What does that mean? Simple, it means some of these guitarists are going to be chasing the rainbow of sound from here to eternity - especially on a Marshall amp. And you know why they bought this amp? it was because it was a reissue and promised that sound they were chasing. They never find it. Often it's a bit like the emperors new clothes - there really is no change in tone, or its so minute you might as well not bothered in the first place. Which brings me to this fine Marshall JTM45 Reissue. Be proud to own it. It does not matter if the resistors are this, or the capacitors are that or the Output Transformer is this or that. What matters is how it sounds to your audience. I guess that they will not be able to tell the difference between this reissue and the original. Sure, reviewers like me, and a host of others will tell you they can hear the difference - and there IS a difference - but personally I would not chase that rainbow, because it is VERY hard to catch. Just buy one of these, sit back, play and listen to what this amp is - a VERY FINE reproducer of sound. Forget what's inside. I'm sure that if you asked Jim Marshall, he would say something similar. There are major restraints on manufacturing today with RoHS compliance, CE approvals, RF emission controls and safety issues for the users, so it's not surprising that Marshall use a regular printed circuit board inside this amp. But they do use DAGNALL transformers and choke throughout, as well as other original stuff to get as near as possible with this amp to the original series, without infringing any of the rubbish that is imposed upon them by do gooders. 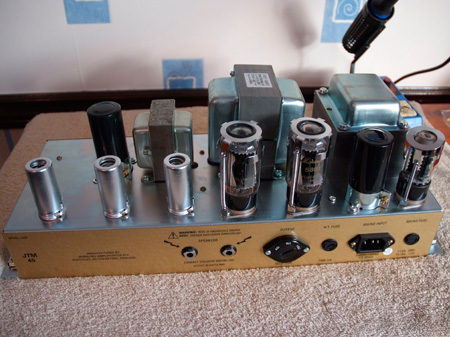 There's not too much to say about this amp - it's like the original in all intent and purpose. It has a regular and higher gain input, Treble Mid and Bass with a Presence control, an on and off switch and the inimitable standby switch. Don't get excited about the effects loop - there isn't one and neither was there one on the original. You wanted a replica? right? well that's what you got. You can do the old trick of looping the two inputs together to expand the tone of this amp and that works fine. But remember one thing, although this amp is rated at a conservative 30 watts (yes that's right 30 watts) and utilizes two 5881's and a tube rectifier, it's still a loud enough amp for gigging, and could well be too loud for bedroom stuff if that's where you practice or play. This amp will not rally get to be good in my opinion this side of about number 6 or 7 on the volume knob so bear that in mind. I think that it also needs the cab it has been designed to work with and not the newer 1960 series. The cab for this one is on the Marshall site and I can recommend it as this is exactly the setup I used with this one. It makes a BIG difference - NEVER underestimate the speaker cab and speakers - the manufacturers design this equipment for specific loads and if yours are different then the sound changes from what the manufacturer intended. Externally except for the power connector and a couple of changes at the back of the amp this looks just like the original and near enough all of your audience will be asking where you got that JTM45 from. If you play blues or classic rock, then you cannot go wrong with this amp. For more modern stuff you can get a TS808 and front end the amp with one for more modern sounds - and the amp still sounds cool. But if you play death metal, or detuned stuff don't buy this amp you will be disappointed. All the other more controlled styles will fare well with this amp. One of the bad bits for this amp is the £1195 pounds you have to spend to get one, unless you buy it second hand - and those are around if you look for them - try and get one untouched from the factory - that's the best way - you won't regret it later. There are other companies making JTM45 clones out there that are 'nearer' spec and use older techniques than inside this amp. But they are NOT Marshall and one thing you can be sure of even today, is that if you buy one of these reissues it is going to be a great amp for the style it was intended for, and will probably NEVER let you down on a gig with regular servicing and tube changes. Remember, if you use older technology, it's older reliability too that can suffer - you would not want your amp failing all the time would you? Absolutely, so get a Marshall - and in this case - get one of these. I have moved forward since owning this particular amp. 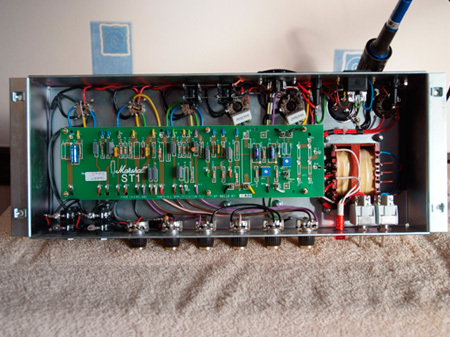 It is now sold because I actually did make my own amp after this review. It took me a very long time to develop and is modified with my own mods and circuit twists to get exactly what I want from one of these JTM45 era amps. But please understand this was no reflection on this amp - it was a great amp and you should have it on your shopping list. There is no video of this amplifiers review at this time.